Many Americans and technology firms filed objections to the FCC's proposal prior to the vote. "This is the right way to go," said Mr Pai ahead of the vote on Thursday. 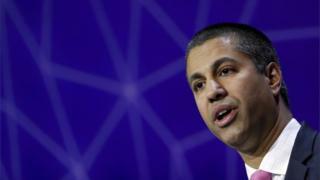 In a statement, the FCC said it expected its proposed changes to "substantially benefit consumers and the marketplace". It added that, before the rules were changed in 2015, they helped to preserve a "flourishing free and open internet for almost 20 years". The vote by the FCC commissioners is the first stage in the process of dismantling the net neutrality regulations. The agency is now inviting public comment on whether it should indeed dismantle the rules. Americans have until mid-August to share their views with the FCC. This call for comments is likely to attract a huge number of responses. Prior to the vote, more than one million statements supporting net neutrality were filed on the FCC site. Many people responded to a call from comedian and commentator John Oliver to make their feelings known. Separately, some protestors also used software bots to repeatedly file statements on the site. Many fear that once the equal access rules go, ISPs will start blocking and throttling some data while letting other packets travel on "fast lanes" because firms have paid more to reach customers quicker. US ISPs such as Comcast, Charter Communications and Altice NV have pledged in public statements to keep data flowing freely. Despite this public pledge Comcast, along with Verizon and AT&T, opposed the original 2015 rule change saying it dented their enthusiasm for improving US broadband. Facebook, and Google's parent company Alphabet as well as many other net firms have backed the open net rules saying equal access was important for all.